Sitting and Standing while Working - Sitting (and even standing) for prolonged periods of time has been shown to be a risk factor for health by numerous studies. For those who work at stationary workstations, a desk where the user can both sit AND stand at different times throughout the day will help break up those prolonged periods of unhealthy stationary work. 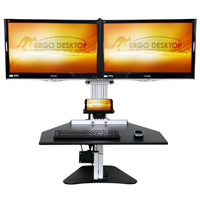 Desk add-on units like the Kangaroo are designed to do just that, by allowing the user to adjust the height of the workstation to accommodate both sitting and standing positions whenever desired. Proper Monitor Height Adjustment - One of the key risk factors for injury in an office setting is an improperly positioned monitor. A good sit-stand desk will help eliminate that problem by having independent height adjustment for the monitor relative to the worksurface where the keyboard and mouse are situated. 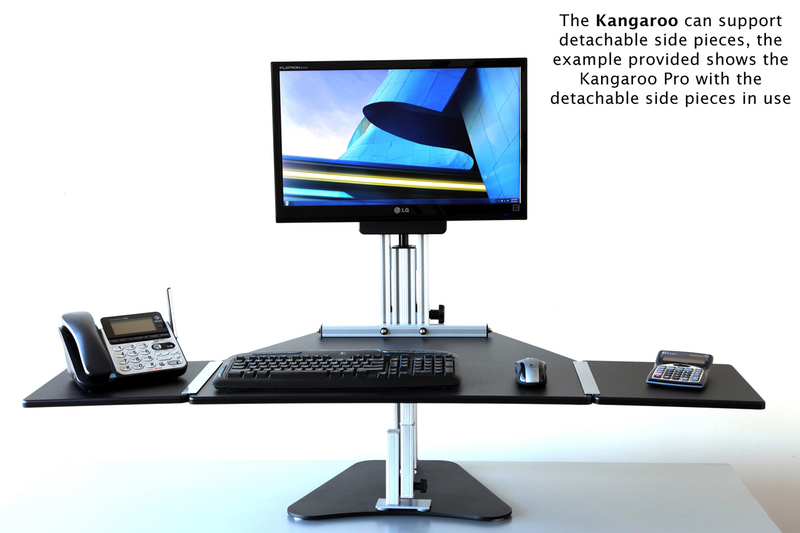 The Electric Kangaroo Elite has 6.5" of independent adjustment to play with, making it easier to adjust the monitor height to its optimal position for the user whether standing or sitting. Large Worksurface - Unlike many other retrofit sit-stand solutions, the Kangaroo provides a generous 20” x 28” worksurface which provides plenty of real estate for the keyboard, mouse and any other devices required while working (phone, tablet, etc.). Sits on your Desk (No Clamping or Drilling): Ideal for desks where clamping or drilling into the desk are not options. 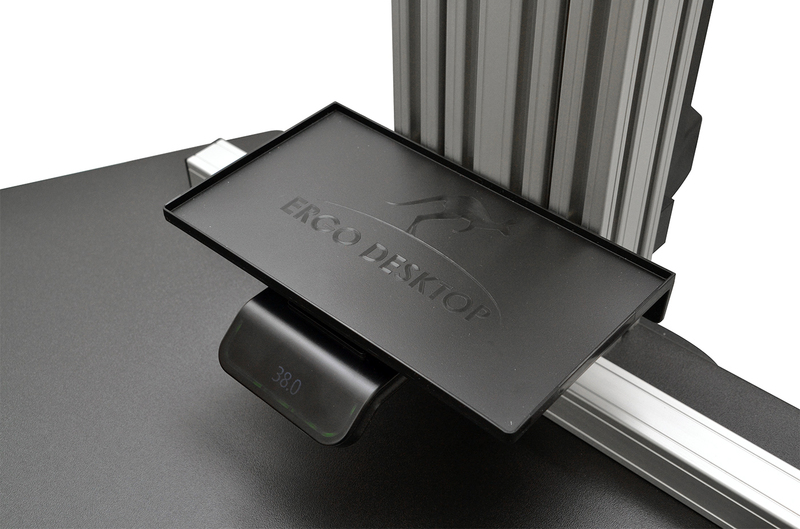 The Electric Kangaroo Elite has a heavy solid steel base that allows the user to position the unit anywhere on the desktop securely without creating a tipping risk. Pads on the underside of the base also prevent any scuffing or scratching of the desktop. 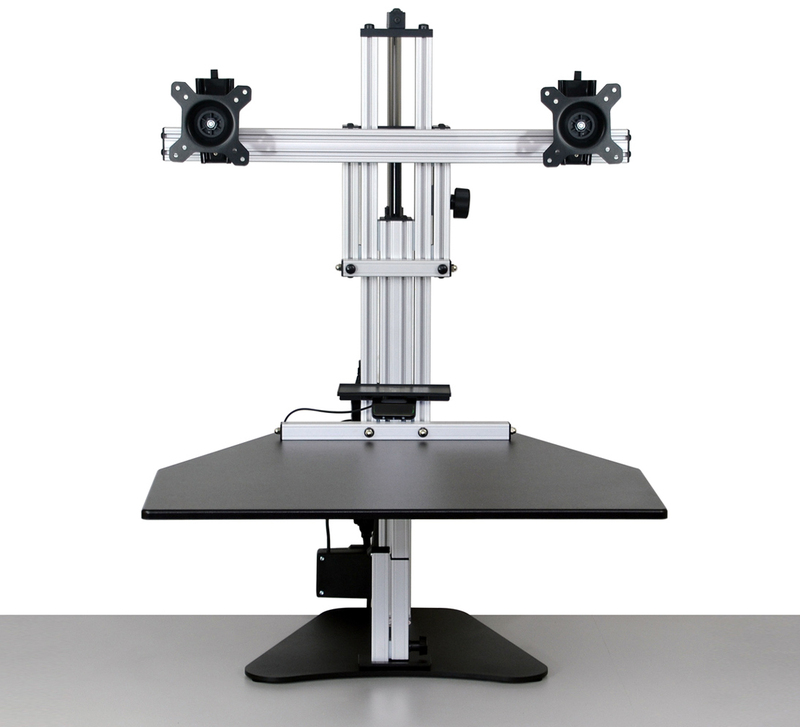 Motorized Worksurface Height Adjustment: Individuals who find adjusting even a gas cylinder (or spring) mechanism cumbersome or difficult due to injury or weakness will find the electric motor mechanism the easiest of all to use for height adjustment; just press up or down on the button switch. 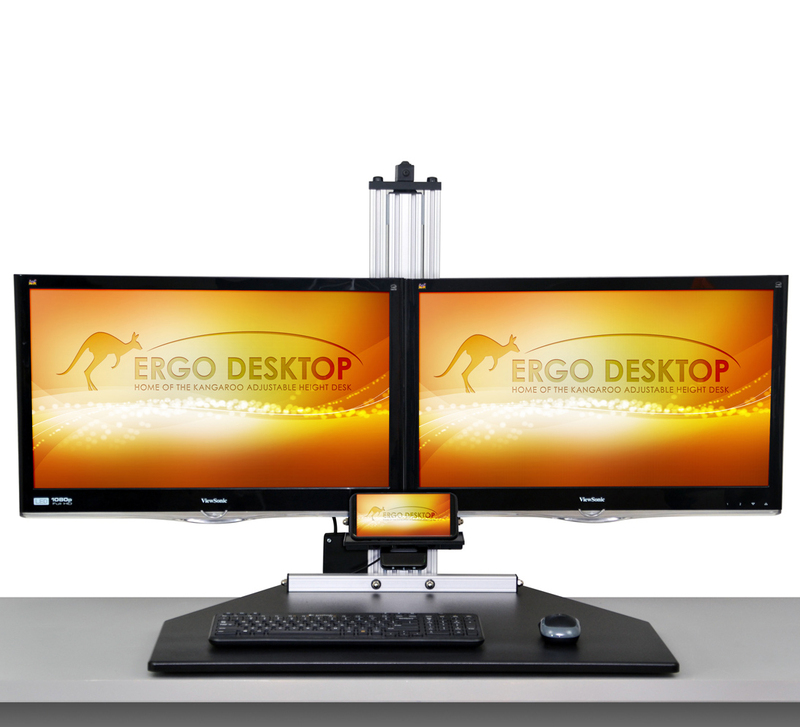 The maximum height raised by the Kangaroo is an impressive 20.5" above the desktop. 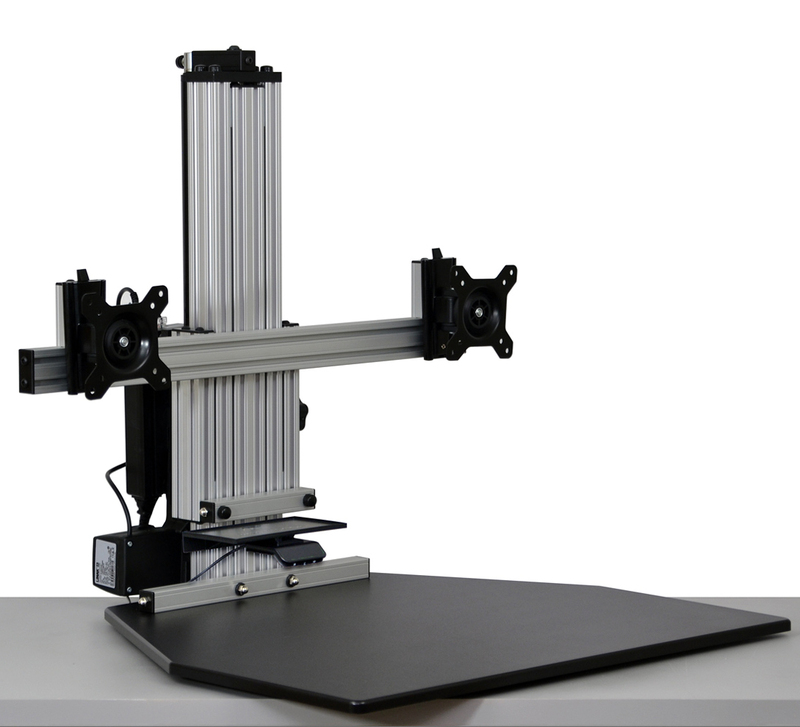 Gas Cylinder Monitor Height Adjustment: Most users will have to adjust the monitor height relative to the keyboard platform only once to get it into the optimal position. The gas mechanism used to do this with the Electric Kangaroo Elite is therefore entirely appropriate. 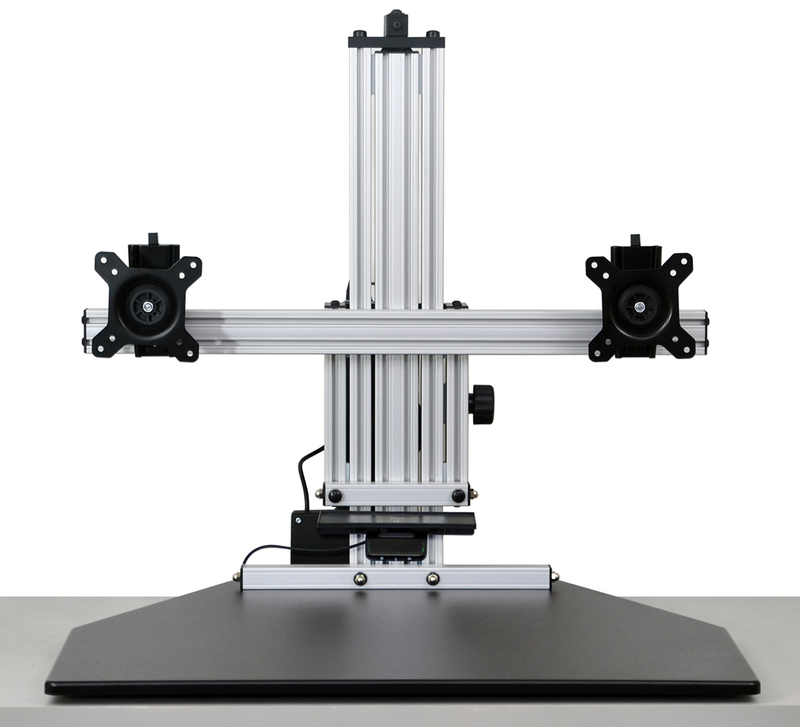 There is 6.5" of such independent height adjustment available. 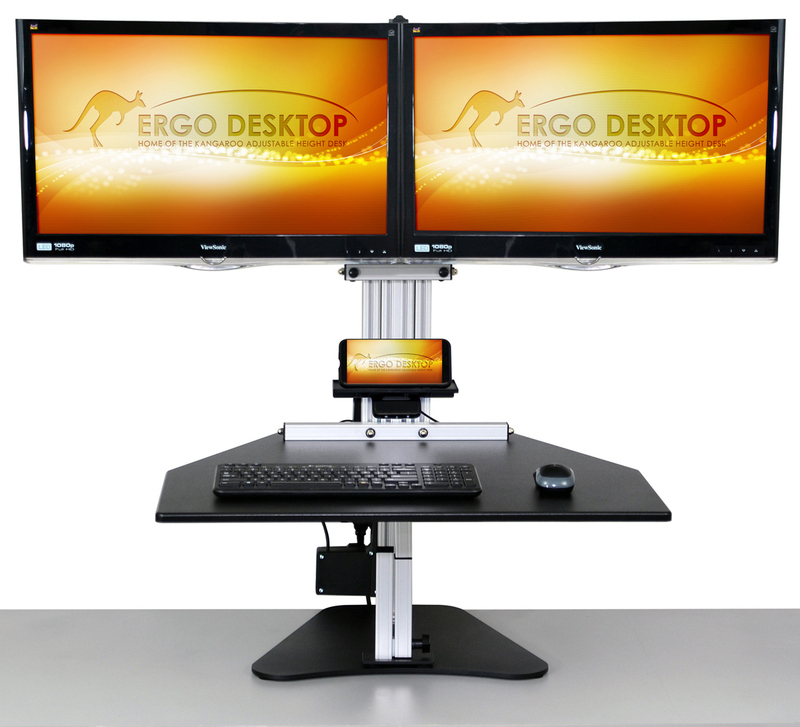 Dual Monitor Mounting: If the user has or needs two monitors on their workstation, the Electric Kangaroo Elite allows two monitors to be mounted via the VESA plate tilters. Monitors must be VESA compatible with a hole pattern of 75 x 75 or 100 x 100 millimeters, and also less that 25" wide (not diagonally). Stabilization Leg: Each Kangaroo unit comes with one stabilization leg, which greatly increases the stability of the main worksurface platform. Because of the increased height adjustment on the Electric Kangaroo, for users over 6' 1" an extra tall stabilization leg is also available upon request. 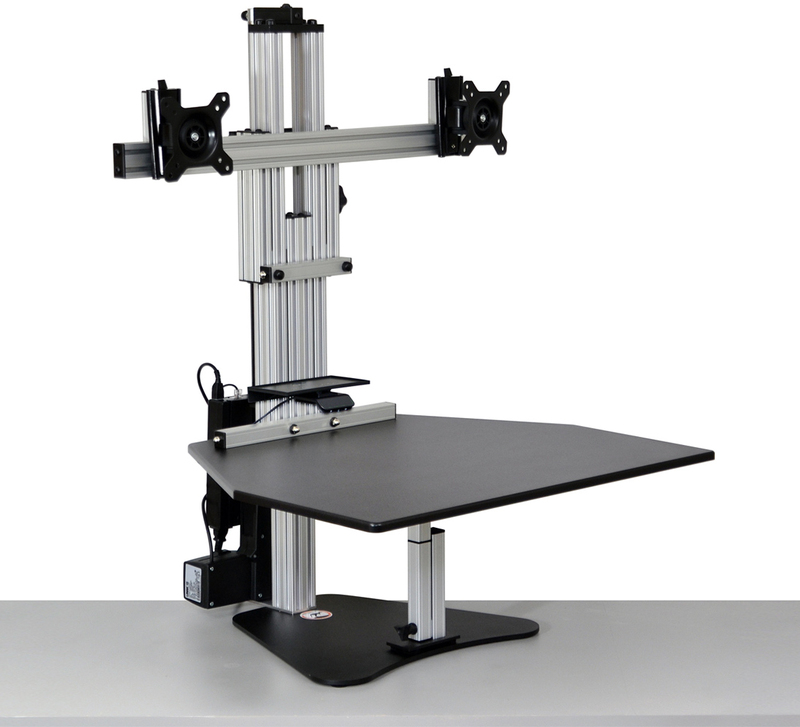 Work Extension Accessories: If the 28" by 24" deep main worksurface platform is not large enough to accommodate all your desktop products, optional worksurface accessories can be purchased which extend the worksurface on the sides and front. 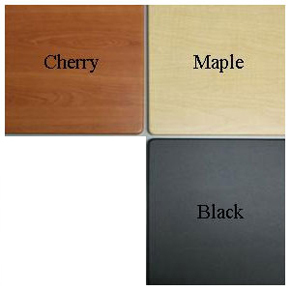 Multiple Colour Finishes: All Kangaroo units are available in four colours: Black, Putty (Special order only), Cherry, and Maple. Additional accessories purchased can be also matched with the same finish. Digital OLED Programmable Button: The Electric Kangaroo Elite includes an updated programmable button that lets the user know how high the desktop is, reminders for sitting or standing (these can be customized), and built-in memory for up to 4 different heights. In addition, the memory feature has an "impulse drive" function for automatically going to a pre-set location by using a simple double-click on the button. Bluetooth-accessible Features via App: The user can also access all of the features of the OLED programmable button by downloading a phone app. Storage Shelf: There is also a 7" x 4" storage shelf for phones, pens, or other small office supplies.